Blowout Sale! Free Shipping Included! Save 61% on the NVMe M.2 SSD Cooler Heatsinks with 20mm fan powerful cooling by Angel Mall at Pacs BG. MPN: JEYI-88888. Hurry! Limited time offer. Offer valid only while supplies last. ★WELCOME TO THE ANGEL MALL★NVMe M.2 SSD Cooler Heatsinks with 20mm fan powerful cooling（This heatsink only fit for desktop PC. ★We have professional R&D team, will continue to launch new products to meet customer needs and, thank you for your supporting! 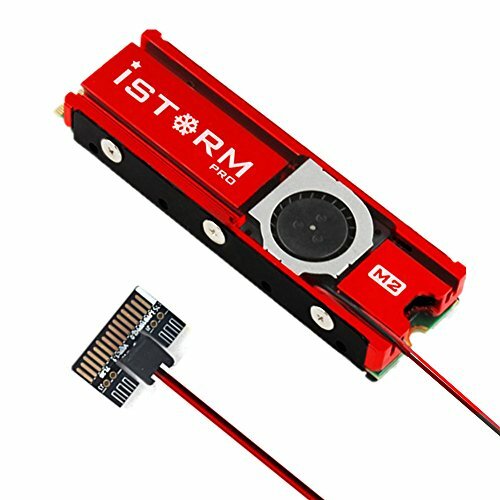 ★Compatible with NGFF PCIe NVMe M.2 SSD Size: 0.87 x 3.15in. (22 x 80mm), fits for Samsung 850 EVO, 860 EVO, 960 EVO, 970 EVO, 950 PRO, 960 PRO, 970 PRO, etc. ★Double-layer design, greatly increase the heat dissipation area, 20mm high-performance fan, low noise and no vibration, speed up to 10000rpm, with 10°C - 40°C cooling effect (Varies depending on the environments), improve your computer's performance, very suitable for game players. ★Heat Conductive Material: Unique Nano silicone thermal pad. Soft and good ductility, compatible with uneven surfaces; Low viscosity, no damage to the M.2 SSD warranty label. If you have any questions about this product by Angel Mall, contact us by completing and submitting the form below. If you are looking for a specif part number, please include it with your message.